Three cougars were sited at the Salt Lake City offices of Goldman Sachs around 7 a.m. Monday. And we’re not talking about women of a certain age out on the prowl. These are real life cougars. Mountain lions. The Goldman offices are located at a remote spot near the University of Utah campus. Three young cougars were spotted in and around the parking garage at 295 Chipeta Way. The security camera captured the prowling. That’s not really very useful. 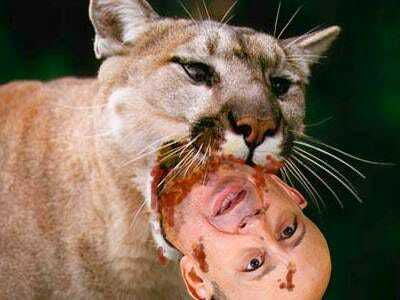 We researched how to survive a cougar attack, as a service to our friends at Goldman. Here’s what we found:Step 1. Get weapon qualified and obtain permission to carry a concealed weapon. Also get your hunting licence. Improve your chances against a cougar attack by using weapons. Daggers and knives can help you survive a cougar attack. Step 2. Get proficient at using these daggers and knives, including drawing them when you’re under attack. Step 3. Travel in groups of at least four and keep the groups close together. Have one person looking forward, the second person looking to one side, a third person looking to the other side and the last person constantly scanning the back. Stay close together so that you can hear what goes on with the others. Have your weapons ready to use in case you spot a cougar ready to attack. Step 4. Bike side by side if you’re biking on a trail. A cougar can jump one of you, knocking the victim onto the other person. The cougar can only concentrate on one person, allowing the other biker to turn around and help the first person fight the cougar. Going single file to clear opposing traffic doesn’t reduce your chances to survive a cougar attack, as the oncoming person sees your group. Step 5. Fight back during a cougar attack. Use a sharp object if you can. Help an attack victim survive if you see someone coming under cougar attack. Poke its eyes with a pen, knife or dagger.